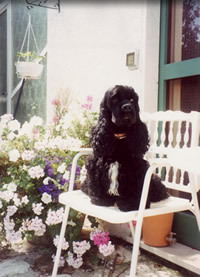 Milou was a beautiful black American Cocker Spaniel. 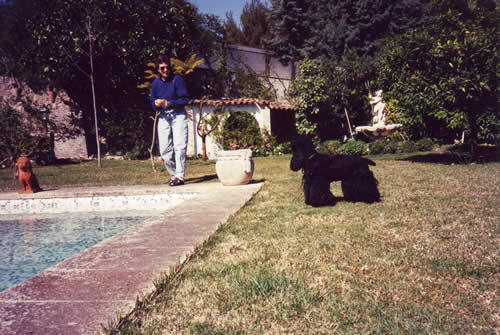 He was bred in Switzerland at one of the top kennels in the country and lived in Monte Carlo with an Italian lady who'd lived in Brazil for so long that she often spoke to Milou in Portuguese! 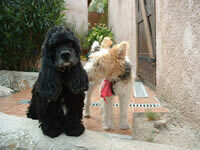 Milou understood Italian, English, French and Portuguese! Sadly, his owner became ill and when it was obvious she wasn't going to get better I was informed that it was in her will that any pets should be put to sleep on her death. 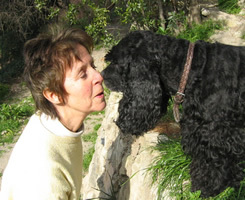 This concerned me greatly but fortunately a few months before she passed away, she allowed me to adopt Milou. He was four and a half at the time and had been living with me for a year by then and spent every available minute playing with a tennis ball. 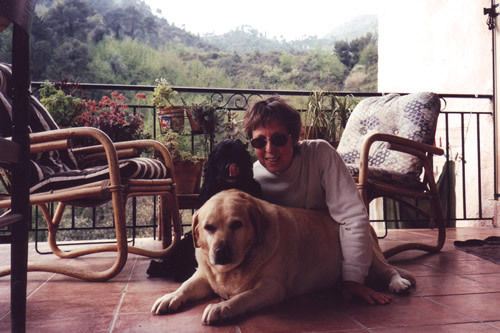 He was already, in my mind, 'my' dog and so, happily for me, he never left. When we lived in Roquebrune, his favourite game was to nudge a tennis ball into the pool and then bark and bark until someone got it out for him. 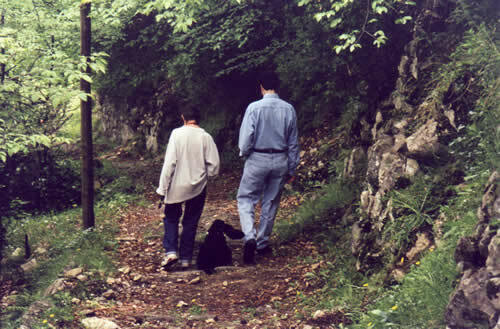 We had wonderful adventures and outings. 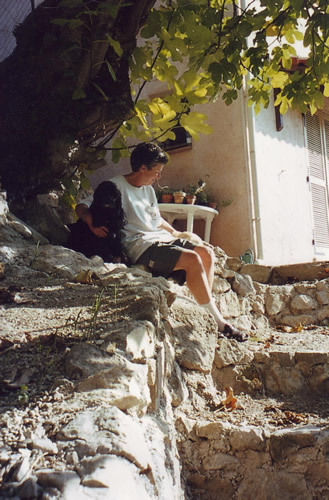 He loved going to restaurants, his favourite being Le Balico in Menton where the waiters always found a little biscuit for him and put a water bowl under the table. 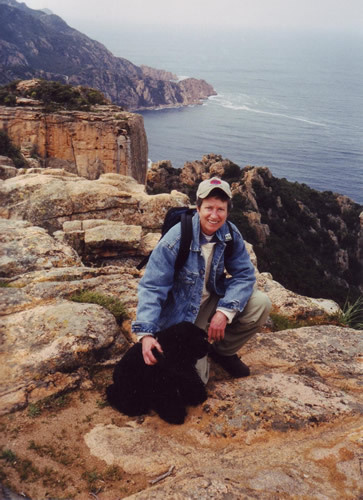 He visited Avignon and Moustiers-Ste-Marie and toured all around Corsica one spring, leading Candy and me up the rugged mountains like the little trouper he was - and he always loved his trips to Italy. Milou’s temperament was exceptional, accepting as he did all the dogs who came en pension, loved his Labrador house-mate, Flavia, and he, in turn was loved by everyone, especially his bed-buddy Candy, who shared her bed with him whenever she visited from America and never forgot to bring him a tennis ball each time. 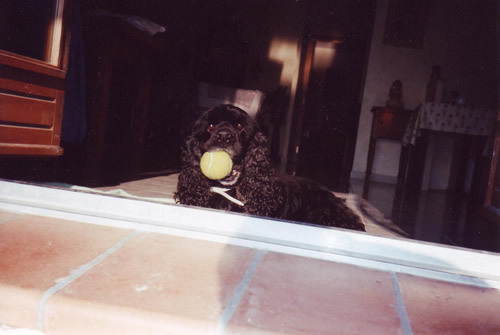 In May 2005, just one day short of his 15th birthday, Milou went to doggy heaven. 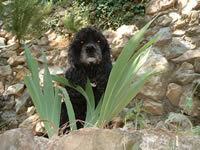 He is buried on the hillside, tucked up with his favourite tennis ball, his last gift from Candy. 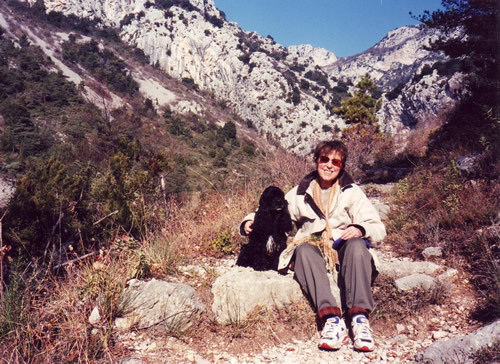 I've been lucky to have shared my life with many wonderful dogs, but Milou was the 'dog of my life’ and, of course, Pension Milou was named for him.